This broccoli slaw with low fat peanut dressing takes about 10 minutes to put together making it a weeknight dinner winner! 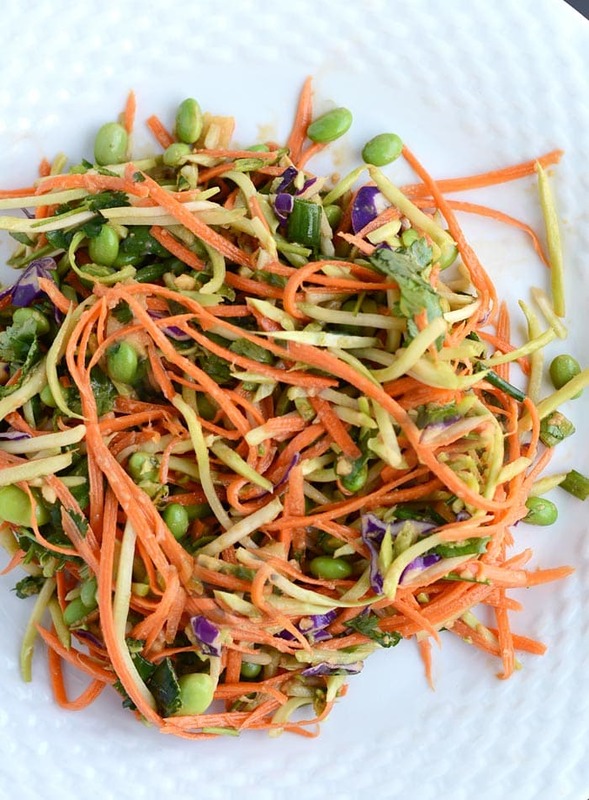 Or anytime, because peanut butter…duh..
Buy packaged broccoli slaw, throw it in a bowl..add julienned carrots, edamame, cilantro and green onion, make the dressing, done! 13 grams of Protein per Serving! 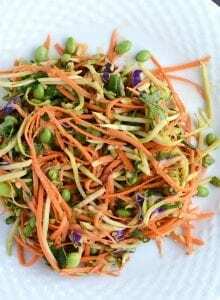 I eat this as an entree and find it nice and filling thanks to the edamame however it would also make a great side, or topping for a bowl of noodles! Or you could wrap it up in rice paper and dip it in the peanut sauce…k why didn’t I think about that earlier. Totally doing that next time! The low fat peanut dressing is made with powdered peanut butter to reduce the fat. While I love a sauce made with real peanut or almond butter, since I’m flexible dieting right now I’m always looking for ways to reduce the amount of fat in my diet while still enjoying all my favourite foods…ie. anything peanut butter, forever and ever! You may have just thought of using P2B in desserts but it actually works great in dressings and sauces, I use it all the time! Probably more than I do in sweet dishes actually! I love making a thick sauce for dipping crispy tofu and raw veggies in! You can find it here on Amazon, it’s a must-have if you love peanut butter but are watching the amount of fat in your diet. 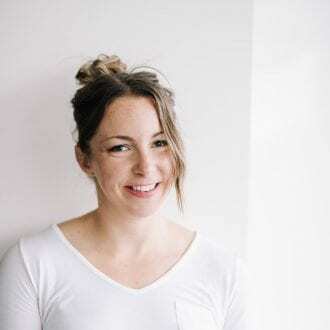 I wanted to mention a little bit about how I cook and a bit about my so-called “recipes.” I don’t cook with exact measurements and I pretty much always play it by ear, unless I’m baking or following a specific recipe…I usually just have a general idea of what I’m doing then, taste, adjust, and throw in whatever I feel like, especially when it comes to vegetables! I really want you guys to have fun in the kitchen too. Experiment and enjoy yourself! Cooking should be fun and playful. Don’t have an ingredient? No big deal! With my recipes, you can pretty much always adjust them to your liking. Food should be easy and fun, and you should be able to prepare a meal with whatever you having kicking around. Maybe not on “Chopped” level or anything 😉 but relax and enjoy, make substitutions, experiment with different flavour combinations and spices, cherish your time in the kitchen. Focus on being grateful for the wonderful opportunity you have to prepare nourishing foods. I don’t want you to have be stressed about “what to make for dinner.” It doesn’t have to be a big, crazy process every night! If you keep your fridge and pantry well-stocked with plenty of plant-based foods, you’ll always be a few minutes away from a simple, healthful and delicous vegan meal. Treat yourself well by eating nutritious food, try to enjoy the process of food preparation and healthy eating can truly become a joy. Try not to think of cooking as a chore because we have to do it every single day for the rest of our lives so might as well enjoy it! Throw on some music, find new recipes you’re excited about, get the family involved, learn about the health benefits of the food you’re preparing, try new cooking techniques and just try to slow down and savour the freedom you have to make healthy food choices. Of course, there are nights when the last thing I want to do is cook but that’s where a little weekend food prep, as well as making sure I’m stocked up with staples is a lifesaver. Set yourself up for healthy eating success! I know we’re all busy and the last thing we need is another source of stress and worry in our lives. So just chill and try to it! Even if you hate the constant clean up like I do. Like, how is there even so many dishes. HOW?? Didn’t think so. Make it. Eat it. Love it! 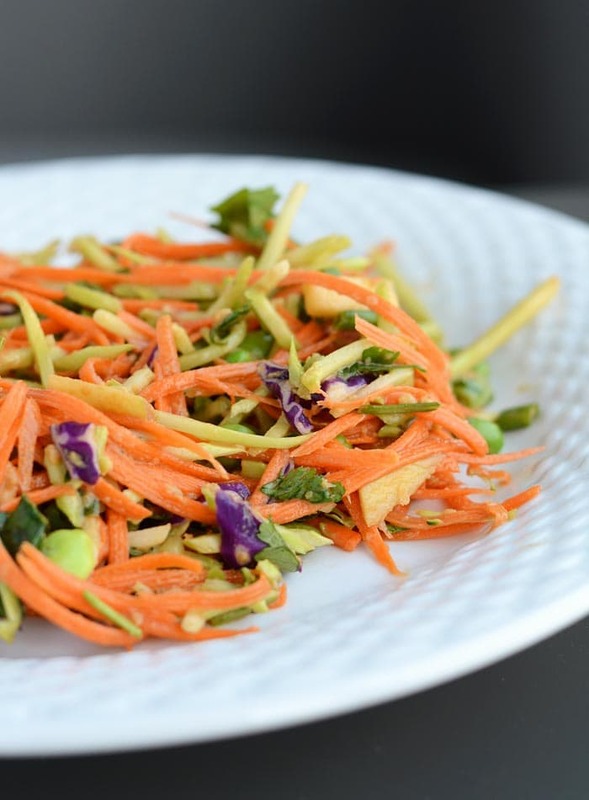 This healthy carrot and broccoli slaw with low fat peanut dressing comes together in about 10 minutes. 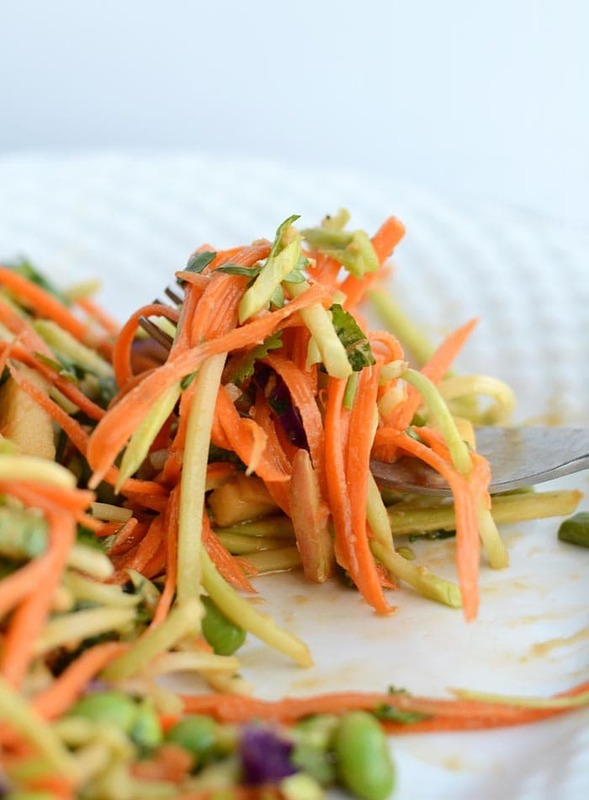 To save time, use packaged broccoli slaw and a julienne peeler to prep the carrots. Thanks to edamame, it also packs a nice punch of plant-based protein. Low fat, low carb, high fibre, vegan, flavour and nutrient packed. Add the slaw ingredients to a bowl. Place all the dressing ingredients in a blender and mix until smooth. Pour dressing over the vegetables, mix and serve. I would recommend using a julienne peeler for the carrots. It’s one of my favourite inexpensive kitchen tools and use it all the time! Buy one here. I also used P2B Powdered Peanut Butter, which I use in my recipes quite often. You can find it here. You can use a very small amount of maple syrup to sweeten the sauce, or another sweetener of choice but this is the stevia I use: buy here. I’ve made this sauce many times, with different amounts of the listed ingredients. Play around and see what works best for you. You can make it super thick and use it as a dip for raw veggies or tofu, or make it a little runnier and more like a dressing. I usually start with 3-6 tbsp of P2B (depending on how thick I want it) and 3 tbsp of soy sauce or tamari. From there, add a bit of apple cider vinegar, lime juice and/or water and see how it tastes. Then adjust the sweetness with sweetener of choice. It’s pretty flexible, so adjust as needed to suit your taste preference. this looks amazing!! i love coleslaw and am always up for trying different types of dressing. also edamame is the perfect addition for that added protein. Pinning!